In high hopes that I would be able to make perfectly round cake pops in 30 minutes. 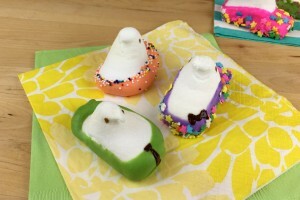 The steps above are made using the Nordic Ware cake pop pan. I used the fudgy cake recipe that was printed directly on the packaging. Heat oven to 325F. Grease and flour cake pop pan. In medium saucepan, over low heat, melt chocolate chips and butter together. Stir until smooth. Remove from heat and pour into medium bowl. Add sugar and cocoa. Mix until blended. Add flour and salt. Stir until blended. Spoon batter into bottom half of pan (without holes) filling each well so it mounds over the top of the pan. Place top half of pan on top and secure with keys. Bake for 15-18 minutes, until toothpick inserted comes out almost clean. Cool 5 minutes in pan, then remove cake pops from pan to cool completely. Melt chocolate Candiquik according to package directions. Dip lollipop stick into melted chocolate and insert into cake (these were so dense, that I really don't think this step is necessary). Dip cake pop in melted coating, spinning to let excess chocolate drip off. Decorate with sprinkles as desired. Place on parchment paper or in a Styrofoam block to set. flying saucer or cake ball? I had to trim my cake balls – I used a knife and ran it around the center lip that was created by the pan. 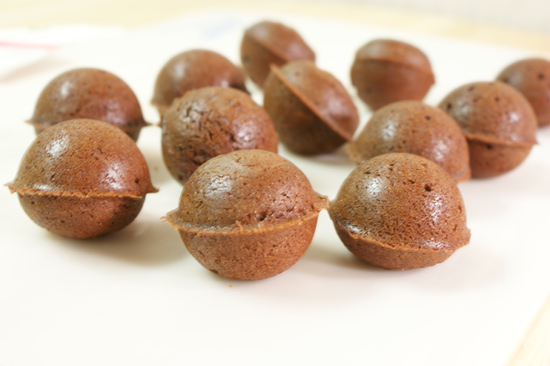 These are dang good by the way – they are perfect little brownie bites…highly recommend this recipe they came with. However, you will notice that they do have tiny little air bubbles, and some of them have flatter bottoms than others. Those little things did affect their overall appearance when I dipped them. But I was able to hide most of their flaws with lots of sprinkles (always a good tip)! I think by the time I filled that cake pan, baked 12 cake balls (refilled with the remaining batter and baked the rest of the batch…note: yields 24 cake balls), trimmed them so they were decently round, I could have hand rolled them. 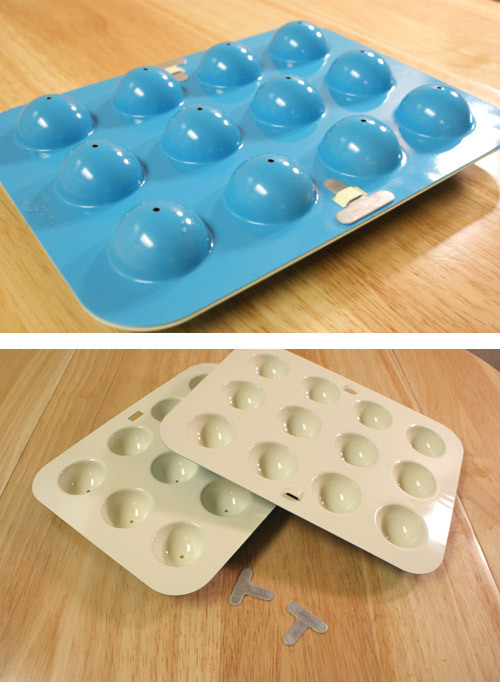 If I were to do any kind of quantity with this, I would need about… A LOT more cake pop pans. That would get pricey, as they range in price from $13 (outlet store price) – $20. attempt #2 was much better (sprayed with a TON of non stick and filled as much as I could)…however, when I tried to coat them in CandiQuik…it resulted in a lumpy cake pop. No bueno. Basically the cake mix was too runny, too airy (lots of air bubbles when it baked), too soft…so again, always use a dense cake (such as the recipe provided by Nordic Ware) or a brownie recipe. But then again, I often find myself needing perfectly round cake balls for pictures and such. So if you’re not worried about them being perfect and don’t mind that they are not the “traditional” recipe for cake pops (made with crumbled cake + frosting); you will like the pan. After all, it worked fine with the recipe provided and I have to say, they were a bit easier to dip than traditional cake pops. Haha….yes, I agree – usually the way it is (handmade is better), isn’t it!? I think you can make more of a variety of cakes an flavors when making cake pops out of the frosting/cake method. Mine are more like a truffle. I scoop with a small cookie scoop and then roll by hand. They turn out pretty round that way! Good to know. Thanks for the review. I’ve just started getting into cake pops and was wondering if there was an advantage to having a pan like that. Hi Janine! Yes…hand rolling for me it is! Unless of course I want a brownie-bite fix! I agree for this reason and so many others, that traditional cake pops are #1. I’ve had pops baked in the “bake pans”, and there is no moisture since its just dry cake and the chocolate. Also, w/ they’re so much lighter, they tear off of the stick, when dipped, so much easier. You went to a lot of work to show how those pans work. Quite honestly, I’m very appreciative of that. I’ve made cake pops before and I’m just not quite a fan yet. I have been considering those pans because they would result in a more cake like finished product. After reading your blog, my answer is, thanks so much Nordic Ware, but I’ll pass. 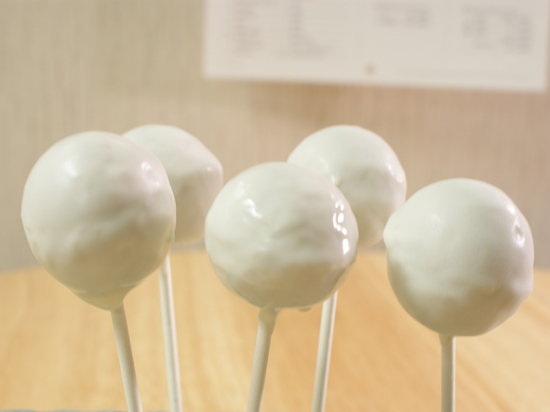 Cake pops are interesting…you either like ‘em or don’t. For me, I had to find my flavor and right amount of frosting (I currently use about 1/3 of the can). When I first tried cake pops, I wasn’t crazy about them. I’m not really a cake (ex: birthday cake, white cake, etc.) kind of person and if there is TOO much frosting in cake pops, no thanks. 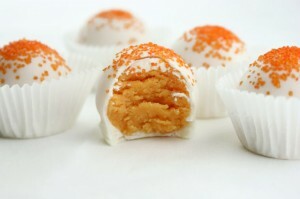 However, I love lemon cake pops (made w/ buttercream frosting) – yum yum. Maybe your thing is oreo balls or any of the cookie dough pops, truffles, etc. Thanks for stopping by! I one of them cake pop pans and I don’t like it at all. I made some and almost all of them had air bubbles in them and when I dipped them, the didn’t hold very good. I think I might take mine back to the store and get my money back. Hi Brenda, I prefer the traditional hand-rolled cake balls as well. The pans are fine if you are just using them for a casual treat or something fun to experiment with, but you definitely don’t get the professional look that you can by hand rolling. Thanks for saying hi! I bought one of the electric cake pans, used a pound cake recipe and they were mostly round. But they fall off the stick. Just not dense enough. I guess I’ll use it to make yummy donut holes because cake pops aren’t happening. Haha, doughnut holes it is!! Of course I love the rolled pops better then bake pops;)! If you get sick of hand rolling them and still want perfect and pretty, check out my HCP-Easy Roller (couldn’t resist the shameless plug on this one)! 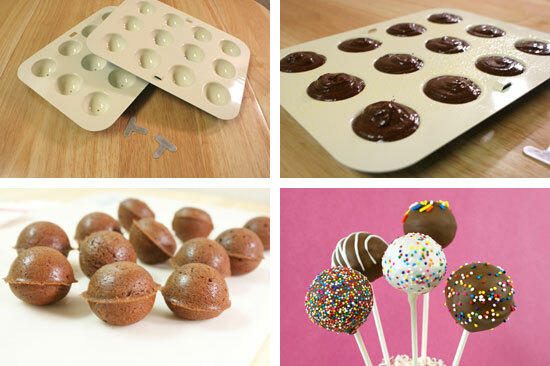 I have tried all of the traditional cake pop methods and I believe that the “cake pop” pan maker is the best. When purchased it provides you with a formula to alter the cake recipe making it denser and there fore the pop actually is a cake pop not a GLOB of mashed cake with tons of icing then the candy coating. When taking the pops out they have a little rim only if you over pour the cake mixture in the pop pan. If the little rims happen use a potato pealer when the pop is cool and it comes of very nicely. Thanks for your comments! There are definitely good things about the cake pop pan. Good idea with the peeler for removing the edges! I found when I didn’t fill them as full with the batter, they weren’t as perfectly round…so I dealt with the edges ;). Have a great weekend! My 16 year old daughter went to all the trouble of buying the Nordic pan and used their recipe, iced them with pillsbury icing by hand, added the sprinkles, and left them as a suprise for my 50th birthday……messy as they were, they will be the best cake pops I will ever have! Hi Karen, that’s the sweetest thing! So much love and thought was put into making them and that’s the most important thing :). Thanks for stopping by. Hi Colleen, you will have fun making them! The cake pop pan is a great way to make a dozen (or so) cake pops and easily dip them – and even better if no one is worried about them being perfectly round. They still taste great! Thanks for stopping by and commenting. 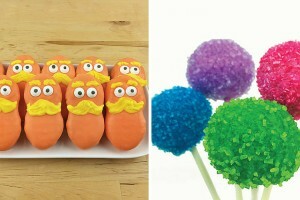 Have fun with your cake pops. This is extremely helpful! I just received a cake pop pan as a Christmas gift and it looks very fun to use but I was curious where I would add the frosting?? I kept reading the instructions and I was like …did I not read everything? I love my cake moist and was worried about this problem. I HATE dry cake. I have made traditional cake pops numerous times and I am so used to making them that way. I usually make them large batches for friends, family, co-workers, etc. I was worried since my cake pan only makes 18, and with the poor comments I have been reading about the pan, I would get frustrated and just want to do them all traditional. I admit, I like smooth, round balls, and I like them to be pretty, especially if I’m giving them as gifts. I have not used my cake pan yet and I am still skeptical. I think I will try it out though just to see and experience it. Thanks for all the help! Hi Naomi, thanks for the comment! I agree – for big batches, the traditional way is great. Try your pan out though, like I said – I enjoyed the recipe that was on the box, but don’t expect your normal ‘gooey’ cake pop ;). Trying to follow your recipe, but it just says “3/4 semi-sweet chocolate chips”. I’m going to assume this is 3/4 of a cup and not 3/4 of the entire package. We’ll know soon enough!!! Hi Roel – yes, 3/4 cup! I’ll correct that in the post, thanks for the catch! Hi Sarah, I’m about to use my Nordic Ware cake pop pan for the first time and I’m wondering if I need to make any adjustments to the Fudgy Cake Pop recipe for high altitude. Here is a little article on adjustments to make in higher altitudes if you are concerned (http://allrecipes.com/howto/high-altitude-cake-baking/). Thank you Sarah! I am a cake pop novice and just wanted to provide some feedback for others baking at altitude – I’m in Colorado at 5400 feet. I used the Fudgy Cake Pop recipe from Nordic Ware along with the cake pop baking pan and followed the recipe exactly except that I went up to 350 degrees for my baking temp. for 16 minutes. My first batch didn’t come out perfectly round even though they had a nice mound on them when I put them into the baking pan. The second batch, however I shaped into a ball in my hand and dropped into the openings in the pan. A little batter came up through the hole while they baked, but I scraped it off when they came out. 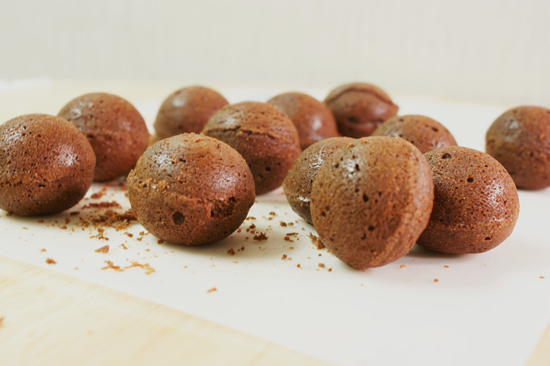 Other than that, they came out perfectly – shape, taste and moistness…like a brownie! Thank you for this post Sarah! Hi Kim – (another Coloradoan)! Glad to hear they came out – they taste like little yummy brownie bites! Have a great day, thanks for taking the time to comment. I for one LOVE the pan it works soooo much better. Every batch that I’ve made has came out perfectly and the key to moisture is to add an extra egg. BTW I have the as seen on T. V. cake pop pan. I tried the baby cakes electric maker they came out small and I couldn’t touch the counter under it 1/2 an hour later cuz it was still super hot. Hi Lexi – the pan does work good for a small batch, I’ll try adding an extra egg next time I use that pan/recipe. Thanks for commenting! I�m not that much of a internet reader to be honest but your blogs really nice, keep it up! I’ll go ahead and bookmark your site to come back later on. Cheers. Thank you for your tips. I will now be returning the pans I bought. Hi Erin – thanks for commenting. If you use the recipe that’s on the packaging, they should turn out fine, if you decide to keep them! Just be careful with any boxed cake mix as they are typically too light Happy cake-popping! Does anyone have a Nordic cake-pop pan recipe that features a yellow cake? I was wondering the same but with a white cake mix? I saw a polka dot cake on Pinterest that you use these cake balls in the middle..but the Nordic pan only has a fishy recipe? 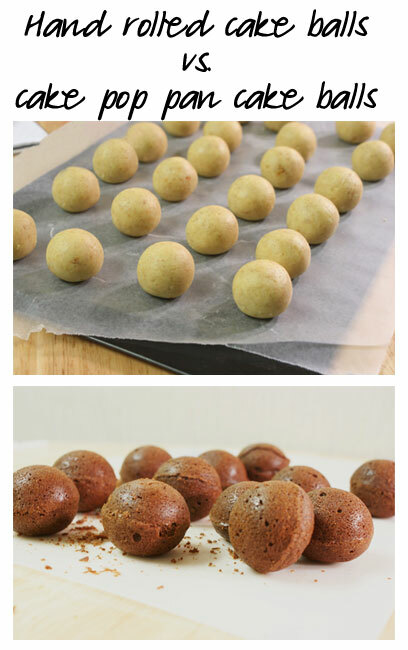 I don’t want dense balls, I just want the same consistency as a regular cake but need to bake the cake balls first. Do you think I would use just a regular white cake mix? 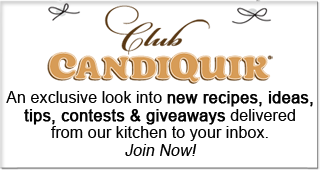 Hi Julie – you could try a regular cake mix (any flavor) in the pan, but you can see from my experience what the result was – most of them fell apart :(, if you try it and it’s successful, let me know! The pan even suggests using a denser cake recipe. The other option is to use regular hand-rolled cake balls (I have seen these used in recipes like you are talking about). Good luck! Now that I’m getting started, I might try the traditional way, too. it can be a little labor intensive to make cake balls – thanks for stopping by! I just bought one of these pans because I wanted to make cake balls that were made from homemade cake and I don’t like the crumbled cake recipe using (yuck) canned frosting. I think they taste more like truffles. I just wanted a simple cake on a stick. I may try Italian Cream Cake, I think that would be dense enough for the pans. When using cake mix, add an extra egg, substitute water with milk, and add one package of pudding. I tried the “Fudgy Cake Pop” recipe, and I did not get round balls. The reason is they did not rise enough (actually only two out of 18 did). Since the recipe did not call for baking powder, I was wondering if you used self-rising flour. My first thought was that you did not as you added salt. I am not a professional baker, only a molecular biologist, but I am used to follow protocol as every “ingredient” in it has it purpose. So how can you expect a cake to rise if you do not include a rising agent such as baking powder? I understand that cake pop batter needs to be dense, but still… Any thought on that? Otherwise, my “not perfectly round cake pops” tasted better and were moister as compared to my previous ones that I did earlier this week using another adapted chocolate cake recipe. 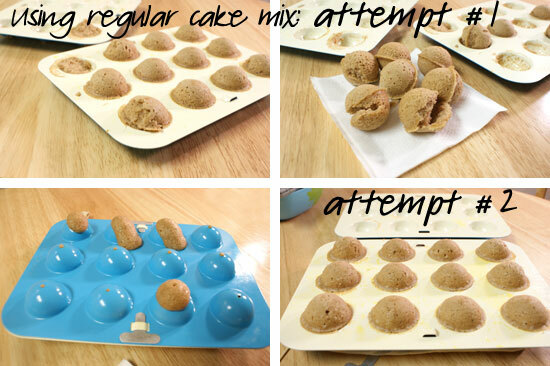 Hi Nathaly, try filling your cake pop pan cavities fuller using this recipe. I did not have any problem with the cake expanding or rising enough to fill the small round hole. And as you can see when I used a recipe that included baking powder (boxed cake), the cake was exploding out of the top hole when baking. Good luck, thank you! Thank you Sarah. I will make more batter to fill the cavities fuller as you suggest. I already tried to add baking powder, and it was a total failure… I got an volcanic eruption! Moreover, the cake balls were too soft and contained air bubbles (not good to stand on a stick!). Shall I add an extra egg to get the cake pops moister, as it was suggested by Lexibug02 (January 8 2013)? Thanks again for your response. Hi Nathaly, I would try it again just filling them – I filled mine as much as I could before securing the top of the pan. You could certainly add an extra egg if you desire a moister cake but I personally haven’t tried it w/ this pan, so I would try it again w/out the egg first. Good luck – let me know how they turn out! As you can see, every one of my cake balls rose fine (when using the fudgy cake pops recipe), so it should be successful! I was wondering if there is a recipe out there for flavors other than the chocolate. I just bought the cake pop pan today and i’m excited to try it but not everyone likes chocolate so my question is can I use a box mix to make these and how do I alter the recipe so that the batter is as dense as the recipe that comes with the pan? Hi Tiffany, I don’t personally have a recipe other than the chocolate. To make a denser boxed cake, add a packet of pudding (dry) and an extra egg. However, I have not personally tried it with those modifications. Let me know what you come up with! Good luck. Can anyone tell me (Miss Caniquik?) what you altered from the original recipe? (You said “Adapted from…”) I’ve been searching high and low for this recipe that came with my pans and can’t find it anywhere. It was our favorite and I’d really love to get my hands on it again. Hi Heidi, the only thing altered was the CandiQuik Coating used. Good luck! 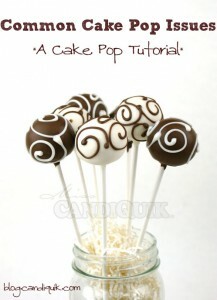 I may of missed this, but did you explain how to make the traditional cake pops? 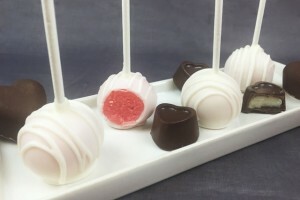 Here is the basic cake pop (or cake ball) recipe: http://blog.candiquik.com/?p=3020. Thanks for stopping by! hi! what recipe of Cake pops do you use? So I just made handrolled cake pops. Yech. I used a boxed cake because someone told me it would be easier. And I only added about 2 tablespoons of frosting– it was pure mush. 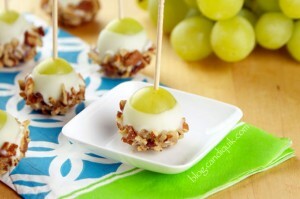 When I dipped them in chocolate, a lot of the balls fell off the stick. Some cracked in half while trying to spin the excess chocolate off. I dipped the sticks in chocolate and then stuck them in the cake ball before sticking them in the freezer for about 20 minutes. What causes them to fall apart like this? I know you keep suggesting a denser cake but literally these crumbs were clumping together as I was trying to crumble from a full cake. I feel like using a cake pan next time would help them stay together better. Thank you for this experiment. I recently purchased this pan and have been pleased with the result. I know that cake pops are all the rage but for my taste, I believe the mix of crushed cake with a frosting as binder is pretty gross. I call them “Masti-cake Pops” since it is like masticated or chewed cake. My kids enjoy them so I buy some for them. I have used this pan to make the now popular Spotty Dotty Cake and it has worked well. (Google Spotty Dotty Cake: it is a blast!) I used a 1234 cake for the first experiment and a Sour Cream Pound Cake for the second time. These are both good yellow cakes and worked well in the pan (homemade recipes are easy to find). I colored and flavored four different versions to have multicolored spots in the cake. This pan is perfect for this purpose! I have just started making cake pops and have had trouble with the one’s made in the cake pan – they are too soft and fall apart when I try to dip or coat them. The one’s that I create with the crumbled cake and frosting have an odd texture and people think that they are not cooked all the way. Is there a way to make the one’s in the pan denser to work better when coating? Hi Leslie, I understand what you are saying. You can use the recipe listed here (the chocolate cake pop recipe), that one was very dense and worked in the cake pop pan and when being dipped. Another option, you could use less frosting when mixing with the crumbled cake. Hope this helps. Thanks! Thanks for the info on how to use the pan. I bought the Nordic Ware pan at a garage sale for two bucks, so worth the experiment. I am going to make colored balls to bake inside a white cake . I saw this on Facebook and LOVED the idea. when you slice into the cake you have colored circles. I am going to try strawberry cake balls baked inside a cream cheese pound cake. Sounds yummy to me. have you ever been heard of “baby cakes cakepop maker” ? i just whant to know are the as bad as cake pop pans? I have heard of it! I have never personally used one. Yeah unfortunately sometimes the shortcuts turn out not to be such a great idea. Glad you were able to make the cake pops even if they were a day late ;). Thanks for stopping by! The brownie recipe came out perfectly round for me. I trimmed the rings easily with a kitchen scissors. Be sure to put these yummy brownie bites in a plastic bag overnight after they are cooled and the outside with soften up. No sweet fronting to deal with inside. White chocolate on outside was great! Those pans do make great baked donut holes though! 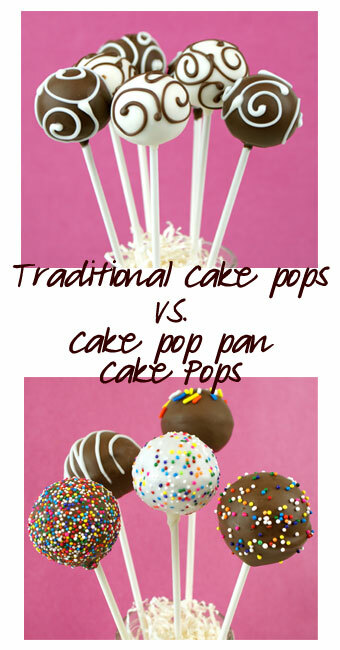 Thank you for the comparison between the pan and the traditional cake pop. I tried them once and wasn’t satisfied but i’m sure i just need to work more at it. I was considering purchasing this for an upcoming event but i think i might just try my hand at trying to roll them again. hmm – that’s a great question! I would *think* it would, but it’s hard to say how much they would expand, etc. It might need a little experimenting with, but it just may work! My daughter gave me one of these Nordic Cake Pop pans for Christmas, this was something she picked out herself, so we decided to try it out together. We had tried a new cake recipe at Thanksgiving and loved it, so we decided instead of the fudgy cake recipe that came with the pan, we would just use that recipe and make cake pops instead of a cake. The cake recipe was much denser than normal cake, but we hadn’t even thought about that. We loved its uniqueness and simplicity, two ingredients, yes, “2″! A box spice cake mix and a 15 oz. can of pumpkin puree. That’s it, mix it together and bake it. It isn’t too easy to mix or spread in a cake pan, but it is perfect in a small scoop and dropped in the cake pop pan. We baked them for 12 minutes since that is what the fudgy recipe said, and after a few adjustments on how full to fill them, they came out great. We dipped them in melted white chocolate morsels. They were the biggest hit with everyone. The funny part is we never thought of this alternate recipe not working. We just got lucky to pick the correct different recipe to try. I have heard that it doesn’t have to be a spice cake mix, that any cake mix will work, but I haven’t tried this yet. Hi Barbara, thanks for sharing this advice! I’m going to have to try this or give the advice to others because so many people have asked! Hi I see the recipe doesn’t use baking powder or soda. Is it to allow for a dense texture to the pops? A nice comparison but I think many are missing the advantages of the pans. The pops are healthier when baked without the extra icing and sugar content. Dipping them is much easier and more fun if one does it the right way. Sticks have to be dipped in chocolate before inserting them in the pop then when they cool down they would be as strong as anything and that is when they get coated. Much easier, less messy, any child can do them and that is a perfect activity. I don’t like the density and overwhelmingly sweet flavor of the traditional cake pop. I have the pan and use regular cake mix. To overcome the problem with the lip, I use clean scissors to cut it off. To decrease the bubbles, I gently tap the bowl with the batter and then also tap the cake pop pan. One might also add instant pudding to the regular cake box recipe if you find it is to light and fluffy, but that is the aspect I like about it. BabyCakes Cake Pop Maker is the best I have ever used for making cake pops. I use regular cake mixes, using milk instead of water, skipping the oil and adding 1/2 package of instant pudding mix. Batter is quick thick when done. I made 4 flavors of cake mixes the other day (480 cake pops in total) and only had 1 batch (of 12) that did not come out perfect. YES, you may get the centre ring, but easily trimmed off with small scissors. I have tried the “traditional” method as well and although you have full control over the size and perfect roundness (or variation of shapes), I do not like the consistency and my family and friends much prefer the regular cake versions.